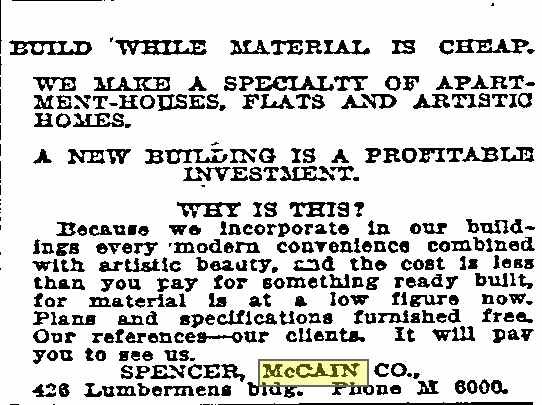 The last few days I've poked around a bit and I figured out the builder on our house: Spencer McCain. I actually always had it, but didn't realize it. 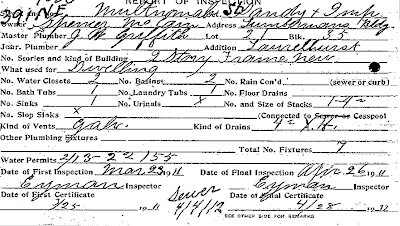 I had this original plumbing permit from 1912. It shows the owner as Spencer McCain. 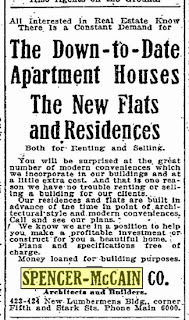 I also found a number of classified ads for lots and building plans by this builder, but not ours, alas. Maybe they just had too many projects in the works to consider this one important enough to advertise. 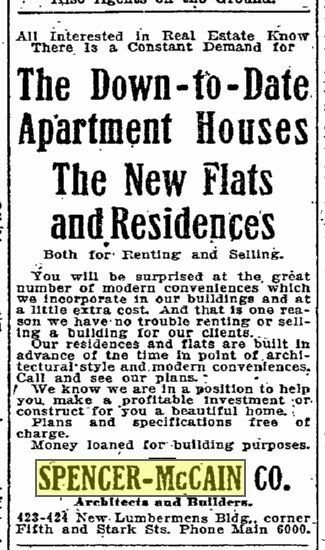 All of these ads were published between 1909 and 1912, and then the name disappears. I wonder what happened . . . Anyway, this afternoon I wrote the Architectural Heritage Center to schedule an appointment to do some research on our house. 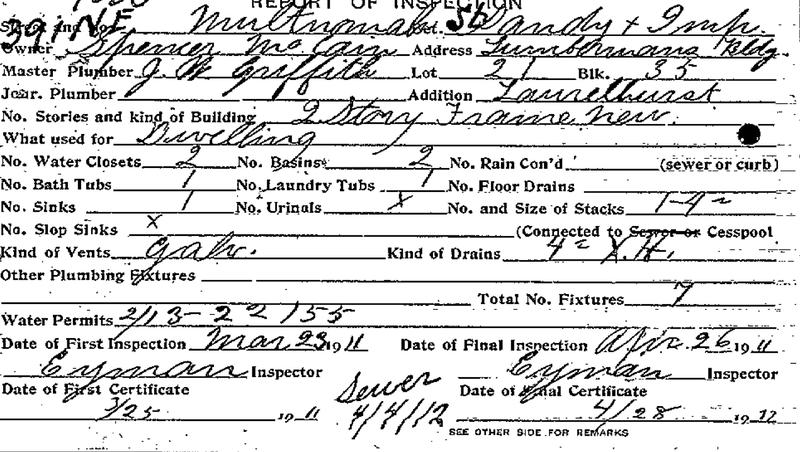 Hopefully I'll be able to find more information about our house specifically. 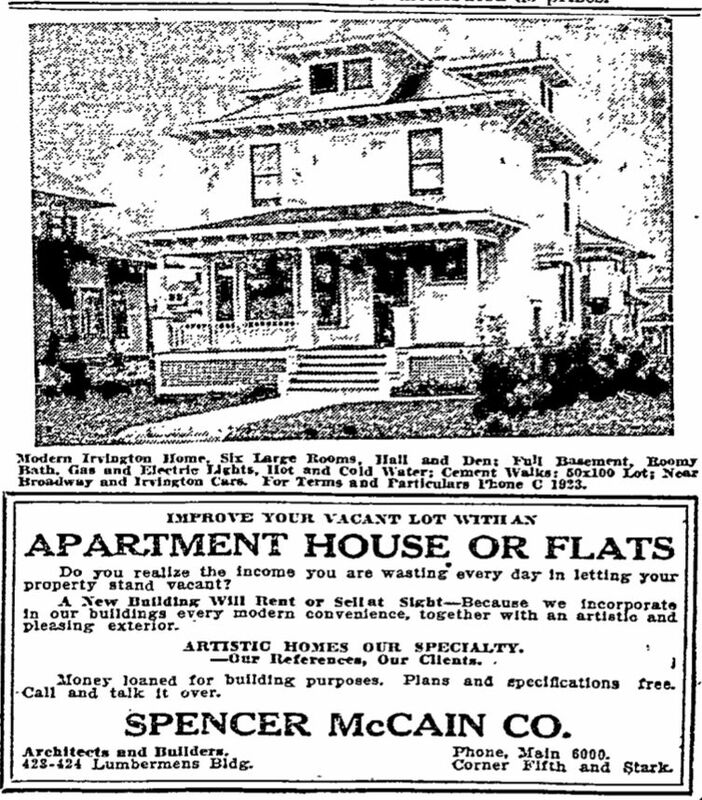 The Spencer-McCain Company has prepared the plans and commenced the erection of a two-story, seven-room, modern frame residence in Laurelhurst. The design is carried on the broad lines with low sweeping roof and broad eaves. To one side and under the main roof is carried a porte-cochere supported by heavy brick columns. The exterior of the house is shingled with brick trimmings. 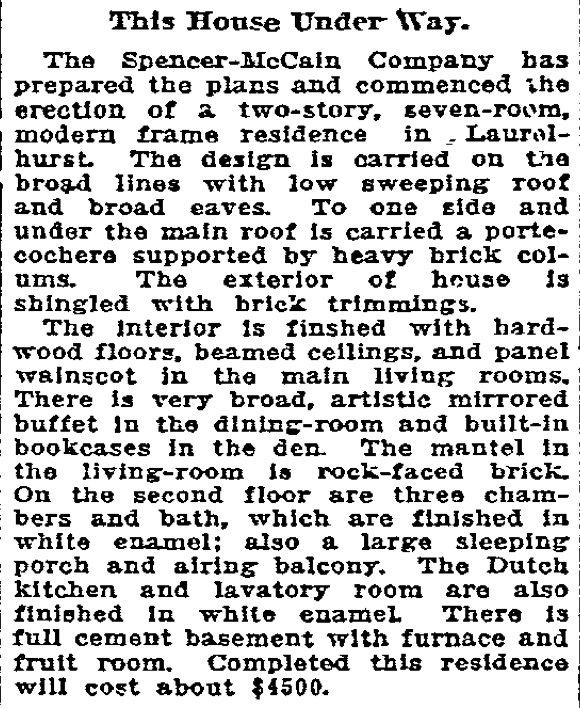 The interior is finished with hardwood floors, beamed ceilings, and panel wainscot in the main living rooms. There is very broad, artistic mirrored buffet in the dining-room and built-in bookcases in the den. 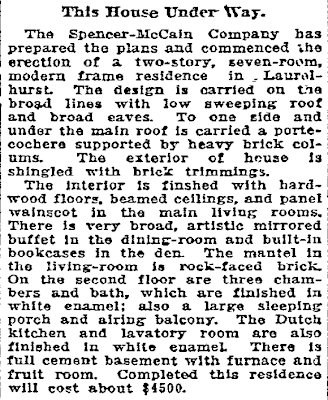 The mantel in the living-room is rock-faced brick. On the second floor are three chambers and bath, which are finished in white enamel; also a large sleeping porch and airing balcony. The Dutch kitchen and lavatory room are also finished in white enamel. There is full cement basement with furnace and fruit room. Completed this residence will cost about $4500. 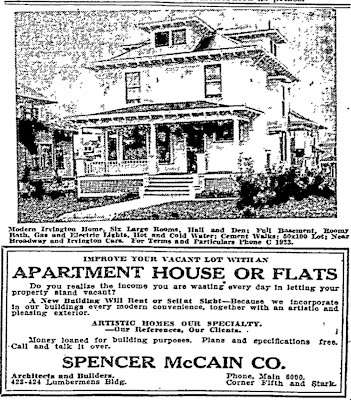 For more detailed entry of this builder, visit my Spencer McCain Page, where I've set out the information I've found so far on the houses he built. I'd love to find something like that about my house. Sometimes I think the first owners ordered a kit from Sears or Monkey Ward's and built it themselves. I've spent hours and hours trying to figure out if our house came from a plan book-I've downloaded dozens and dutifully went page by page through them to see if I could find our house. I'm sort of glad to finally have a bit of the mystery figured out. 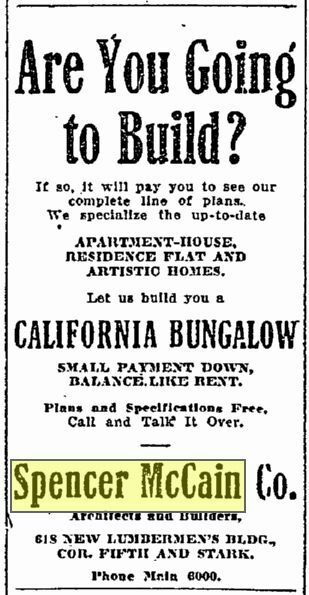 Though, now I have the mystery of what happened to the builder after 1912 . . . 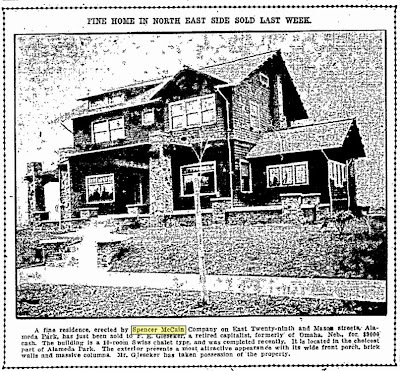 I love the Irvington house in that last ad. That is what I'd like to get, ultimately. For now we have our Craftsman knock-off that's only 13 years old, and not only are the first owners/builders still alive, their kids go to school with ours. Nice family, and they assure us that they didn't hide any money under the carpets. Dang! We have done pretty extensive research on our house. Ancestry.com gave us the most information about the people. You can use it at the library and while you are there, check out the "city directories." They are the phone books before broad use of telephones. That is so awesome! 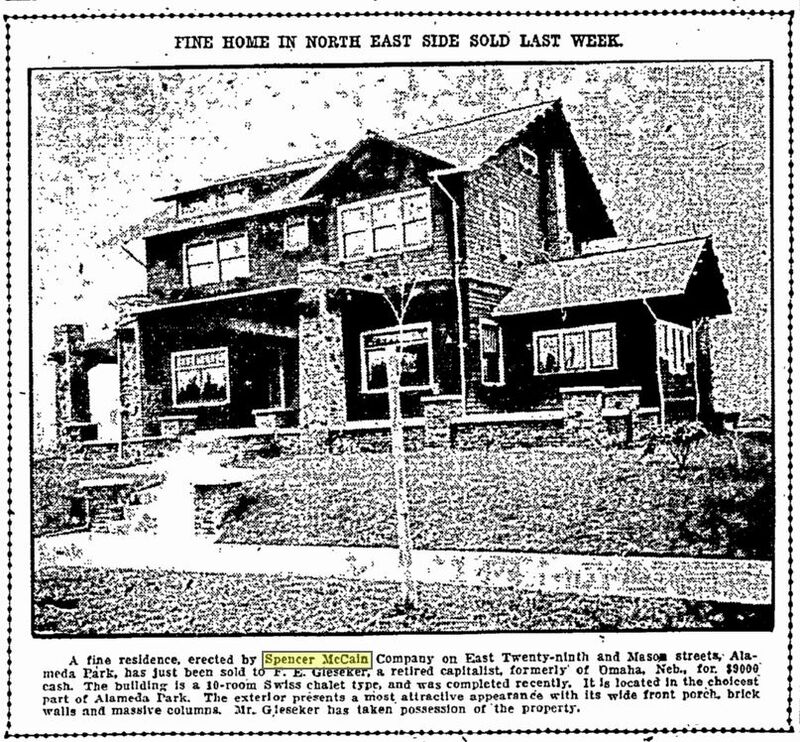 I have traced the family that built my house (like Sherrill, I use ancestry.com) I have collected a lot of newspaper articles and all the census & voting records of the family. 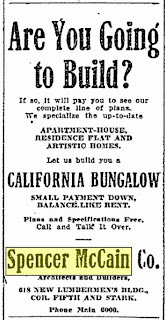 I would love to find one about when my house was being built. One of these days I'll spring the $250+ again for Ancestry.com, but I just don't have the time right now to make it a worthwhile investment. The last time I subscribed I probably only used it for a few days.